I had the opportunity and pleasure to be apart of the VH Excite Your Dinner Blog Tour Round Two. I was pretty excited to be one of the bloggers chosen. I love cooking with VH Sauces and have been doing so for a few years now from time to time. Dinner around here usually means cooking up some of my usual meals, which I can admit at times may get a bit boring. By the time the kids are out of school we have a pretty fast schedule, which don't leave time for me to cook up many new meals. So when I received the Kid Friendly Themed pack from VH to create two fun meals with my family that my kids cold help me with, I knew it would be a good time because we were shaking things up. Boy was I right. To start off, the theme pack I received was kid friendly and came with not only one, but two board games we could play together as a family while I was making dinner. We received Kids Charades along with Animal Memory Game and the kids also got a few activity books which they enjoyed. We had a pretty fun time playing the games for family night. 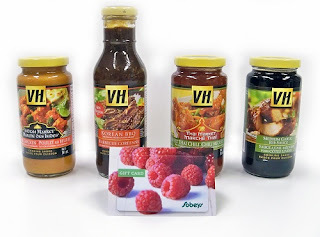 Also with the package I received VH Soya Sauce, VH Korean BBQ Sauce and VH Butter Chicken Sauce, Pam cooking spray, plus two recipe cards with suggestions on meals I could make with and for my family. What screamed out to me first was the Butter Chicken Pizza. So after going to the store to get all the other ingredients I needed to make this meal I came home, the kids, hubby and I played a couple of rounds of games before I went ahead and started dinner. Pre-heat oven to 425°F (220°C). Stir together VH Butter Chicken Sauce, yogurt, garlic and salt. Mix 3 tbsp of the yogurt sauce with chicken pieces; set aside remaining yogurt sauce. Cover and marinate chicken for 15 minutes. Spray a small skillet with PAM Original Cooking Spray; heat over medium heat. Add marinated chicken pieces; stir-fry until no longer pink inside; about 5 minutes. Let me just say that it takes a lot for me to try anything new, this was absolutely fantastic. One of the best pizza's I'd ever made and my husband thought so as well. His response was, "Could you make another one so I could bring some to work with me?" We both loved it that much. It was gone by the end of the night and since the already made pizza crust came with two in a pack, I sure did make another one for him to take to work and his co-workers loved it too. From now on I'm definitely going to be making this pizza often. It was new, exciting and it was very easy to make. The directions were clear and not difficult at all and best of all, you get a gourmet pizza to enjoy that took you little to know time to make while still enjoying your evening with your family. For more delicious and easy recipes to enjoy with your family, head on over to VH Sauces Facebook page, they have tons of family friendly recipes listed! Along with the opportunity to make a delicious meal with my family came the opportunity to share this with not only our readers, but with another blogger. I decided to choose the lovely lady behind the blog, Addicted to Recipes! I adore your blog and the recipes you post, so I hope you enjoy the gift to come for round three!